Going into this race, I kept my expectations low. I hadn’t trained well or often. Most of the training period had consisted of IT band issues on my side and ankle issues on Jonathan’s side, with an added dose of insomnia. I knew Jonathan would be fine, but I was disappointed that his first half marathon experience would include probably a lot of walking because of my lack of training. However, we said we would just do it for fun, not care about our time, and just do whatever I felt like I could. My only real goal was to not get a personal worst, which just meant beating my Walt Disney World Half time of 3:07. We left the house around 6am for the 7am race start. This soon proved (we thought) to be a bad decision because traffic was terrible to get to the race. We didn’t get to park until after 7:00. It was pouring rain as we walked from parking at the stadium into downtown. We knew we would have a little time before our corral (19) left, so we had a final bathroom break before heading up to the start line. Apparently, there had been lightning in the area, so when we finally arrived close to 7:30, the race hadn’t even started yet. 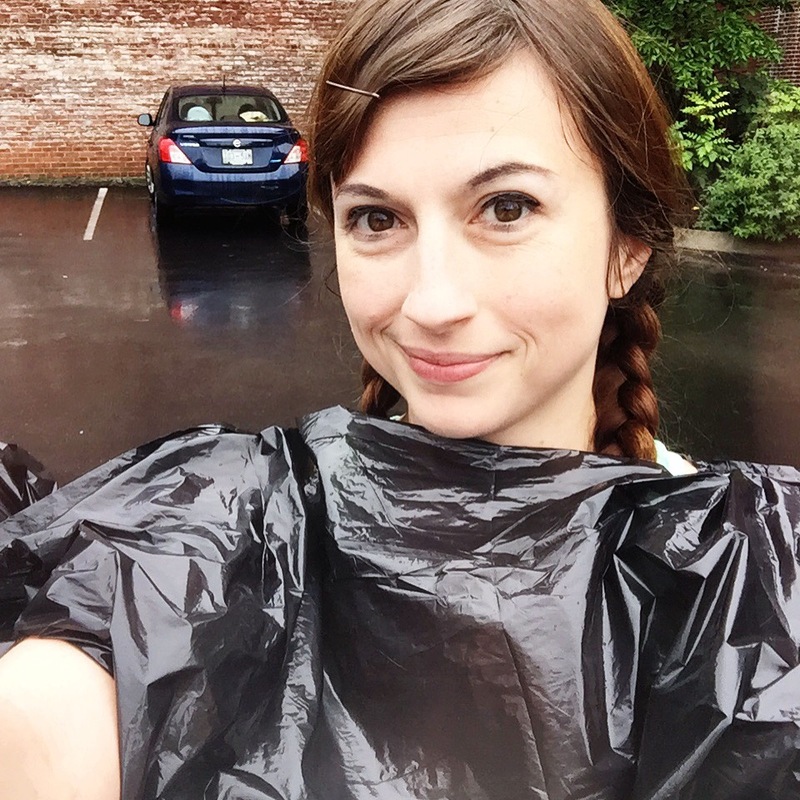 Jonathan took this opportunity to stretch, and I just hung out looking awesome in my trash bag. It had stopped raining at this point. My strategy to start out was to run flats and downhills and walk the uphills (and water stops). I was feeling pretty comfortable with this strategy, wanting to make sure I conserved some energy for the end, and hills are what had been giving me problems in training over the last couple months. Jonathan stopped for a quick bathroom break on mile 3. Soon after the start of mile 4, I ate my first lemonade Huma gel. This felt like it gave me some good energy (caffeine buzz?) and so the next three miles were pretty good. I even ran up some hills. It also helped that these miles are my favorite of the race, running through the Belmont area with all the spectators giving out high fives and cheering you on. The next few miles were hillier and a little tougher. I trudged on but my stomach was starting to feel a little funny. I thought maybe I was hungry again, so I ate my second gel. This turned out to be not such a great idea. My stomach went from just a little rumbly and full on pain. We started walking a lot from that point on because I felt like I was going to throw up whenever I ran. On mile 11, I took a bathroom break, but it only moderately helped. We ran a few times, but most of this stretch was just walking and trying to finish. If Jonathan hadn’t been with me (and I hadn’t wanted that medal so bad! ), I probably would have called it quits at this point. I was in a ton of pain. The course had changed a little this year (at least compared to two years ago) and the ending had a lot more hills than before! Not cool! After we topped the last one, we started to run into the finish. My stomach felt okay, and I was able to finish well. I did finish ten minutes ahead of my PW time, which is all I really wanted to do, so I can’t complain much, although I wish Jonathan’s first half marathon experience could have been better (he says he still had fun, even though I made him walk a ton). I do wish I could have prevented the stomach issues, but I still have no idea what happened. It hurt for the rest of the day, even just lying on the couch. I was happy with the stretch of miles through Belmont. Too bad I couldn’t have kept that momentum up. The race had a decent spread of food at the end, though, for once, I didn’t have much of an appetite. I ate a few pretzels and drank some chocolate milk. We didn’t hang out too long, as it was starting to rain again. I do love the medal. 🙂 It is my new favorite. Hot Chocolate is the only race I’ve run consistently every year since I started running. 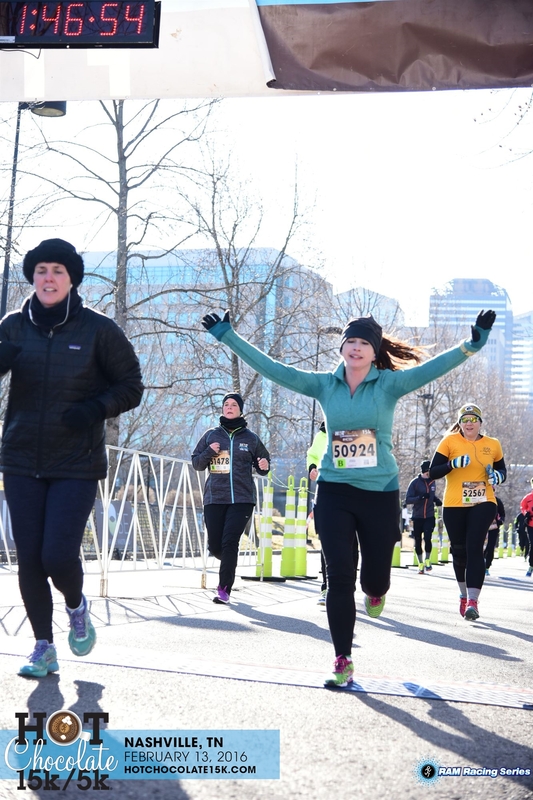 (Links to the 2014 Nashville Hot Chocolate 15k and 2015 Nashville Hot Chocolate 15k.) It’s usually a fairly good predictor of how well I will do at whatever end-of-April half marathon I’m running (in 2014, my half pace was a little faster, and last year my pace was a little slower, but they were close). So it’s kind of like a goal pace long run. However, I haven’t quite figured out what my half goal pace is this year, so my plan for this race was as follows: I wanted to average about a 10:30 pace, which is faster than I’ve been doing my long runs. I wanted to accomplish this by doing the first 5k at a fairly comfortable pace (11:00ish pace), the next 5k around 10:30, and the final 5k with everything I had left (aiming for around 10:00 pace). The weather was forecast to be pretty similar to how it was in 2014: high teens with a wind chill in the low teens and sunny. Brr! I arrived downtown around 6:30am, but I didn’t head up to the race site until 6:45 or so. I was supposed to meet my cousin Gillian in Corral D (I had been placed in B, but was moving back to run with her), but it was chaotic, everyone looked the same (like ninjas), and she had put her phone in her bag at bag check, so I wasn’t able to find her before we started. I had worn one of my old ballet warmup sweaters over my race stuff that I was going to throw away anyway because it had a huge rip down the side seam. It did its job to keep me warm and I threw it to the side right before the start. The race started off okay. I was slightly annoyed at the start because there were already walkers in the way (the first few corrals clearly say NO WALKERS!) that didn’t know race etiquette and you had to weave around. This is probably why my watch distance ran so long in the end. 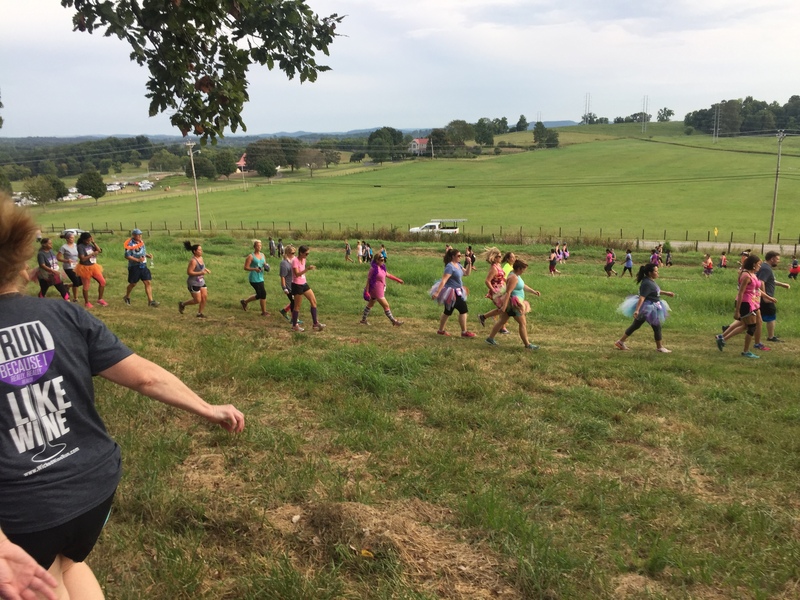 The second mile has the giant hill that I hate every year. I made it up, but it seemed like a lot of people were struggling already. The 5k people split from the 15k people during the third mile, so the course got much less congested and it was easier to run. Hence my little pick up in pace. I made my first water stop during the fourth mile. The water was so cold I could barely down it. And I finally saw Gillian! The sixth mile is comprised of two out and back sections within Centennial Park, so I kept an eye out for her, figuring she was ahead of me. And she was! We waved to each other, and I never saw her again after that; she finished about three minutes before me. These miles were the worst. We were running from the park back to downtown and the wind was blowing against us, and it was SO cold. I actually got colder these last three miles than I felt at the start. 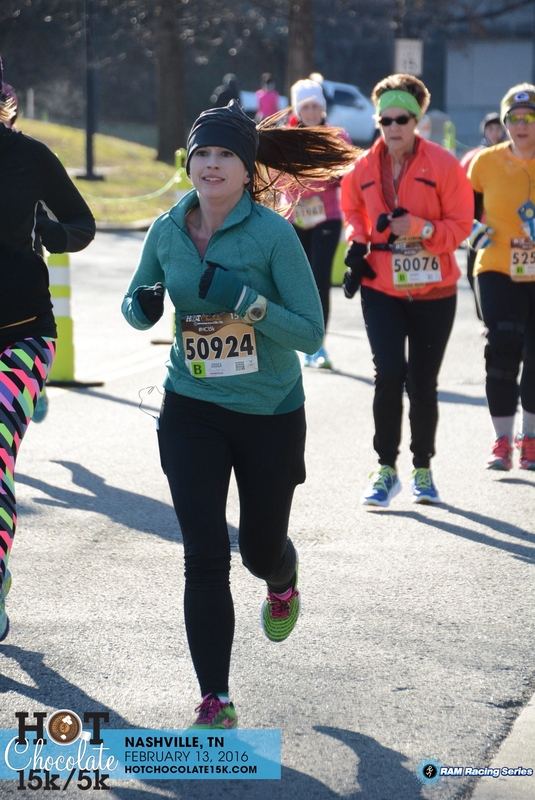 My time on mile eight was a little more than I would have liked because I was fumbling with my phone trying to get my music going for the last bit of the race. Hard to do when you are wearing three layers of fabric over your hands. I took a short walk break just after the nine mile marker to prepare myself for the finish. I know that makes no sense logically, but it helped me so much mentally. 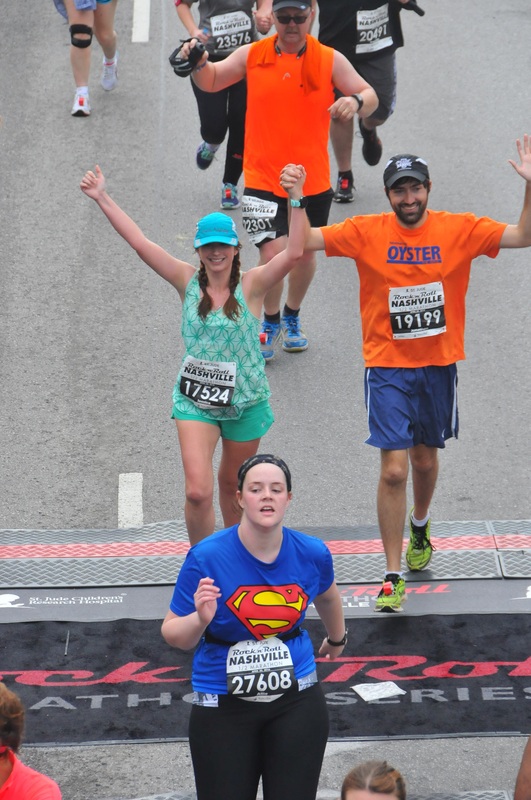 I pushed super hard across the finish line until I had the feeling I was going throw up. I actually thought I might do it this time, but I didn’t. I got my medal and my hot chocolate. I was done. The race was well done, as always. On the Thursday before the race, they announced they would be implementing their cold weather plan. This meant they would be diverting people slower than 13 min/mi to the 5k so the volunteers standing out in the cold could go home sooner, which I think is smart. It was super cold. It’s not something the race directors can control (without changing the date), but I do wish that it wasn’t 20 degrees on this weekend every single year. The weekend before it was in the 50s and the weekend after is supposed to be in the 60s, but we didn’t get above freezing the weekend of the race. 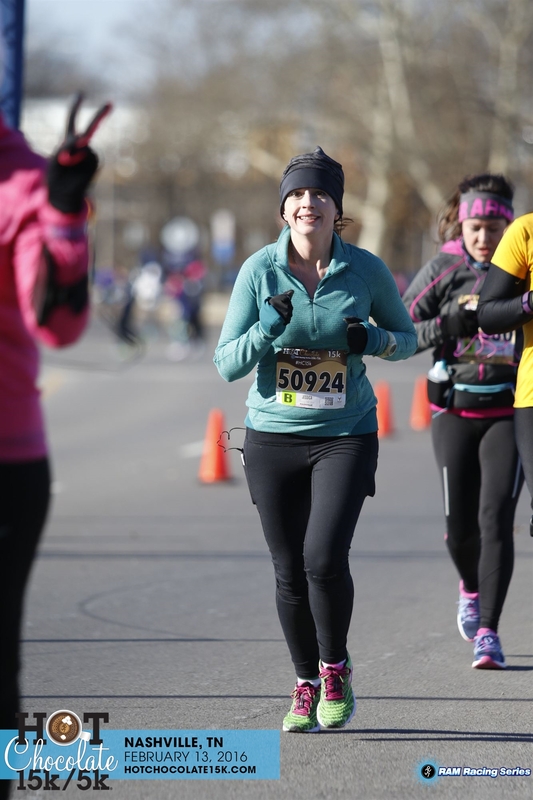 I would love to stick around and enjoy my chocolate and cheer on my friends and wait for people, but I’m always frozen solid five minutes after finishing. I was so cold this year, I started to have a panic attack because it was so painful. Note to self: If you run this next year, bring Hot Hands for after the race!! The swag was great, as usual. 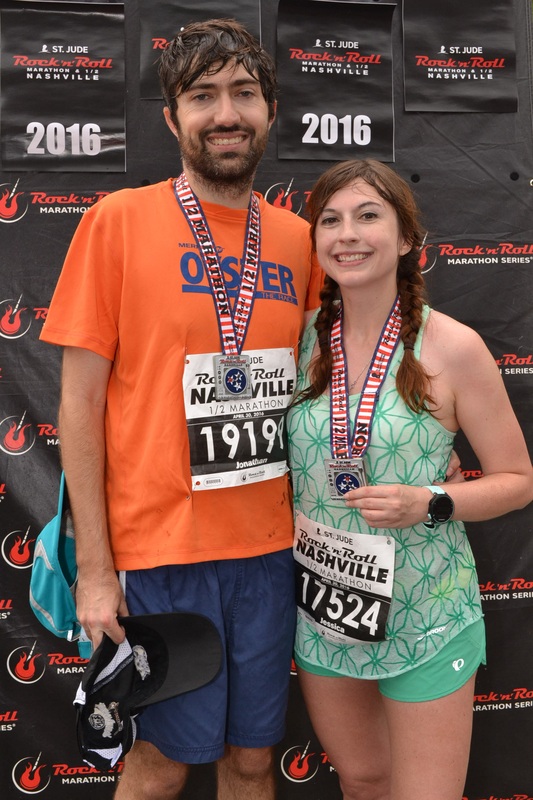 This year my jacket had “2016 Finisher Nashville” stitched onto it for being one of the first 10% to sign up. I feel like the mug had more dipping options in it, including three heart shaped marshmallows, which were yummy! The average pace for these in miles instead of kilometers is 10:42 min/mi for the first 5k, 10:20 min/mi for the second, 9:55 min/mi for the third, and 8:19 min/mi for the last little 0.22 km that my watch went over due to weaving or whatever. 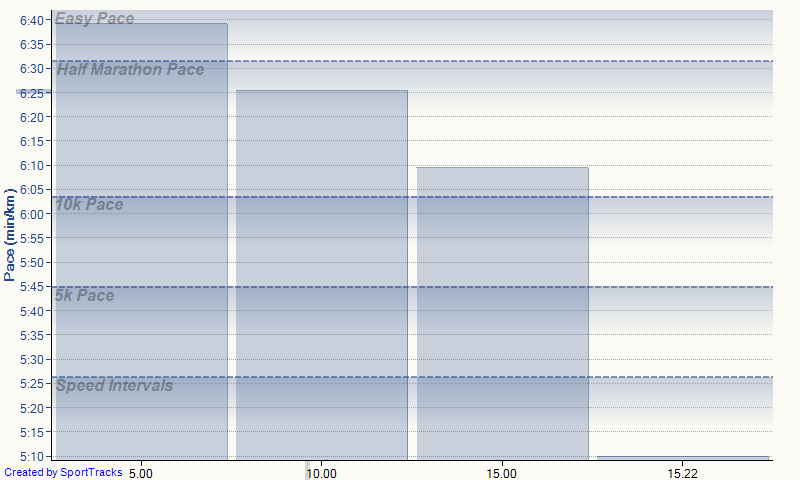 Based on this pace, I’m looking at about a 2:20 half. I’d like to be closer to 2:15, so we will see what speed work can do. 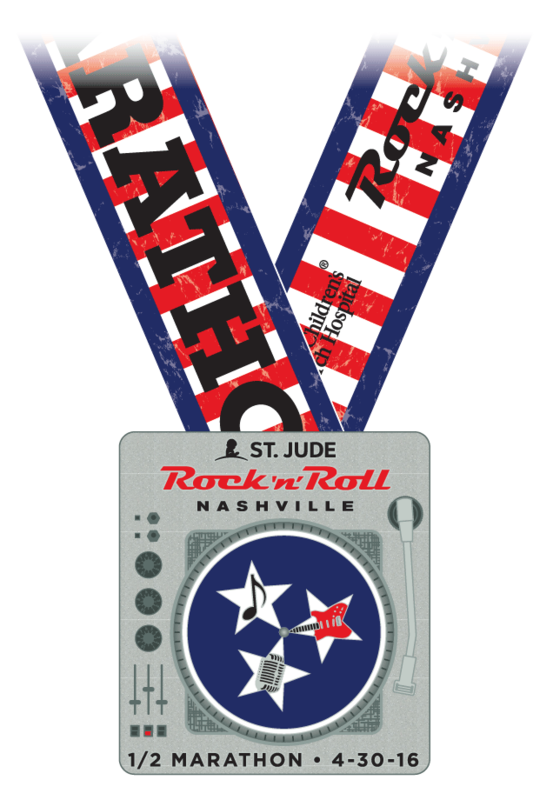 Rock ‘n’ Roll Nashville medal! I’m glad it’s not another cowboy boots or guitar shaped medal. The marathon medal looks exactly the same (except it says marathon) and has a blue ribbon with white writing. 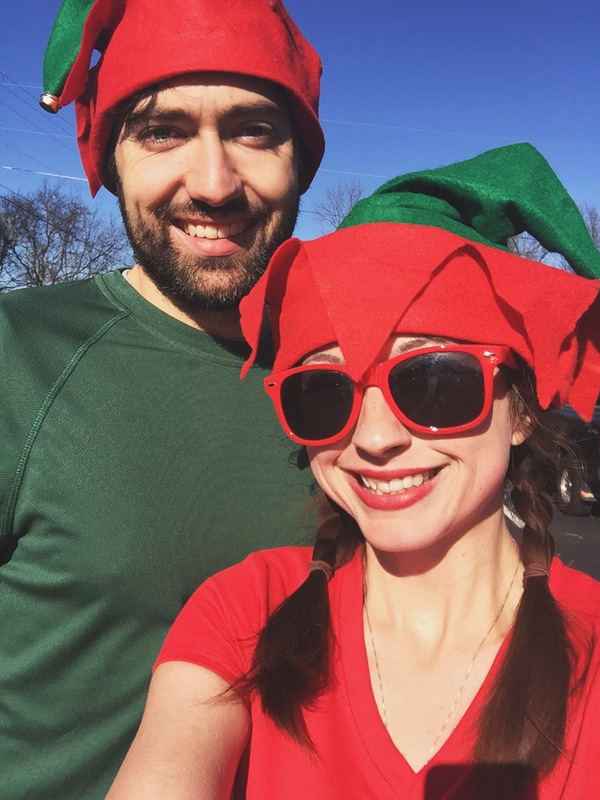 This race consists of a half marathon and a 5k which start just before the Christmas parade in Mt. Juliet. This appealed to me when I was signing up, as it meant there would possibly be spectators along some of the route from the people who were waiting for the parade to start; I like spectators. As I’ve mentioned, I initially signed up for the half, but as it got closer and closer, there were increasing signs that I shouldn’t run it. My training had not gone great. While I had made it up to an 11 mile long run, it was painful and hard and not fun. And after that long run, I started getting weird aches up and down my left leg (sometimes in my knee, sometimes in my calf, sometimes my ankle…it moves from day to day). 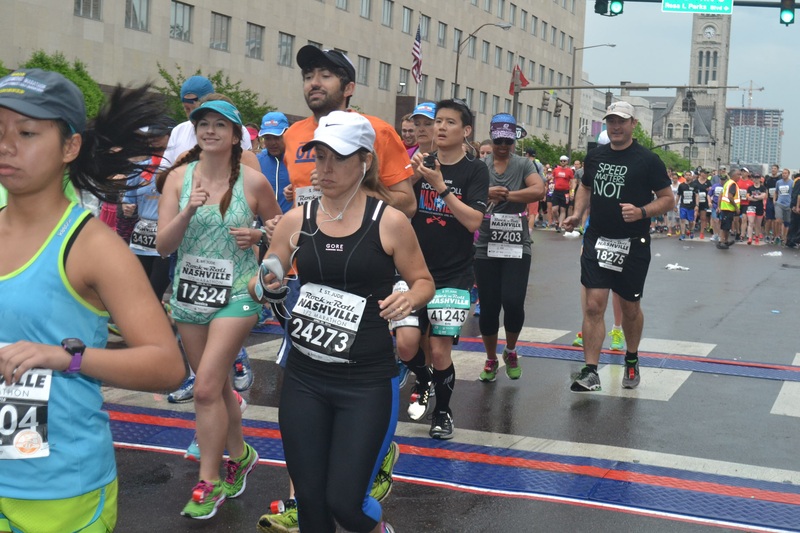 In the week before the race, I considered dropping the run altogether and transferring my bib to someone else. Then Jonathan said he would run the 5k with me if I switched to it, so I decided to go that route and made the change three days before the race. The 5k didn’t start until 10:55am, so it wasn’t too early of a morning. We got up, Jonathan ate some eggs, and took our time getting ready. We arrived at the school where the start and finish is around 10:30. We went inside for a final bathroom break and then came back out to cheer on the half marathoners as they started at 10:45. I felt some pangs of disappointment that I wasn’t running the half, but I knew it was for the best. Soon it was time for us to start. This wasn’t a huge race; the half and the 5k had maybe 200 people each. We placed ourselves in the middle of the crowd and soon we were off. I wasn’t entirely sure what to expect from this race. I definitely didn’t have any time goals. I hadn’t run three miles straight through since the beginning of November (right before that 11 miler), so I mainly just wanted to complete the thing without walking, but that was going to be dependent on how my leg felt. At the start, Jonathan kept trying to urge me to speed up, but I was insistent that I not go out too fast. Even though he never runs, he is a lot speedier than me, so he’s not used to getting passed in races. We were doing a pretty steady 11 min/mi pace, and I told him to deal with it, hehe. This mile was all along the parade route. 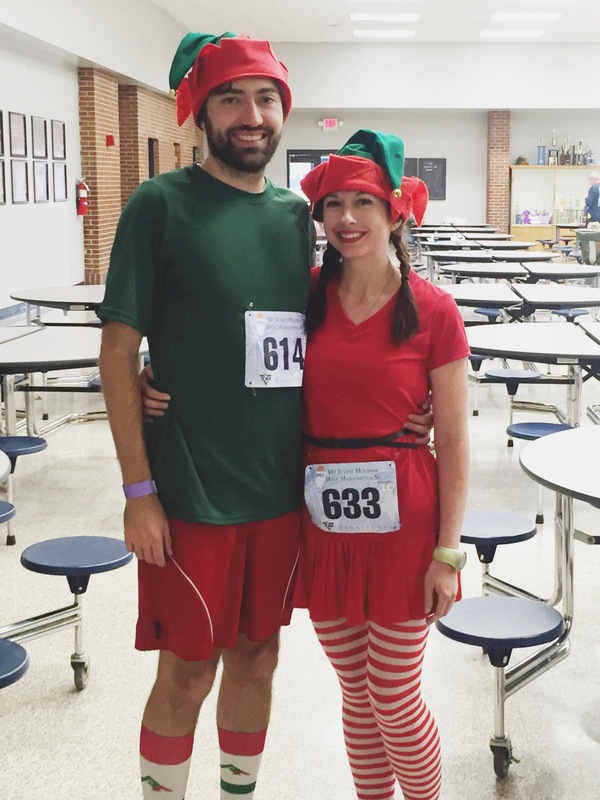 We heard lots of kids yelling, “Look, elves!” as we ran by and I gave out a few high fives. Definitely the best mile of the race. On mile 2, we turned onto a residential road so the spectators were gone. A very hilly residential road. This mile was almost completely uphill, hence my slow down. Jonathan ran ahead of me most of the time, but I was still determined not to push too hard and have to walk. There was a water stop around the halfway point, which I was desperately thankful for. I began to push a little bit more, knowing this was the last mile. My leg was killing me and I was starting to have some GI discomfort, but I just tried to hang with it. Jonathan told me we should run this entire mile at his pace (7-8 minute miles), and I just looked at him. Crazy man. I told him I would when we got to the last tenth of a mile. Not too shabby. Even though it’s nowhere near my 5k PR, I was happy with this time considering how much discomfort I was in by the finish. I don’t think I could have pushed any more. This was a pretty good smallish race. I liked the spectator support on the first mile, though I wish it would have continued throughout the whole race. Packet pick-up the day before was no problem. The email they sent out said IDs would be needed and you couldn’t pick up other people’s packets, but when we got there, they didn’t check IDs and people were getting packets for their friends. The shirts were unisex, which I didn’t realize when I signed up or I would have gotten an XS instead of a S. The goody bags had a couple nice little extras, like Chapstick and some plastic sunglasses. The medals for the half looked nice; I’m sad about not having it! The post-race food was good. There were bananas, chips, cookies, granola bars, and chili. The awards ceremony seemed a bit disorganized. We missed the door prizes at the beginning because we didn’t realize where the ceremony was going on (it was in the school gym). There was supposed to be a costume contest, but we must have missed it. I don’t know if they did it before or after the age group awards, which is all we saw. Overall, however, it was a holly jolly good time! Amanda and I had had our eye on this fun run for over a year. When they finally announced a Nashville date, we were in! They offer two distances: a 5k run where you get a glass of wine at the end or a 1k walk where you get to taste several different wines on the course. We decided to do both, of course! The event was held at Tap Root Farms down in Franklin. There was a line of traffic leading up to parking and I was afraid I was cutting it close, so I jumped out of the car to let Jonathan finish parking while I went to find Amanda who was waiting in line for me at packet pickup. Thankfully, packet pickup went quickly, we met back up with Jonathan, who set up a lawn chair and bought a bottle of wine to enjoy while we were on the 5k course. The email they sent out stated the following, “The course is a TRAIL COURSE. IT IS NOT on a road/paved surface. It is a hiking trail, so expect terrain that is more typical of hiking instead of a typical road 5K. There are a few roots, rocks and foot-bridges.” A fair warning to anyone that may do this in the future: they made this trail quite possibly the morning of the run. No one had ever run on it before; it was fresh. That means there were not “a few roots [and] rocks”, the entire course was roots and rocks and things that will trip you. It was not a normal running trail (or hiking trail, for that matter). It was basically impossible to run. Don’t expect to. The grass portions weren’t bad, just crowded. We ran as much as we possibly could, but the trail was narrow and nearly everyone was walking, so even when there wasn’t a ton of stuff on the ground, there were people in the way. But this was a fun run and not timed, so it’s not like it super mattered, unless you were just counting on it being your run for the day. I think they tried to spray paint some of the things that might trip you. We finally came through the finish (after about an hour!) and got our glass of wine. Yes, you do actually get a real glass, which was pretty nice. We totally thought they didn’t get a picture of us, but apparently they did. After drinking some more wine with Jonathan, it was finally time to line back up for the 1k walk. I’m writing this race report waaaay too long after the event to actually remember what types of wine they had out on the course, but we did get another keepsake glass at the finish of the walk as well. We stuck around for a bit, finished off another bottle of wine and got some food at one of the food trucks that was around.